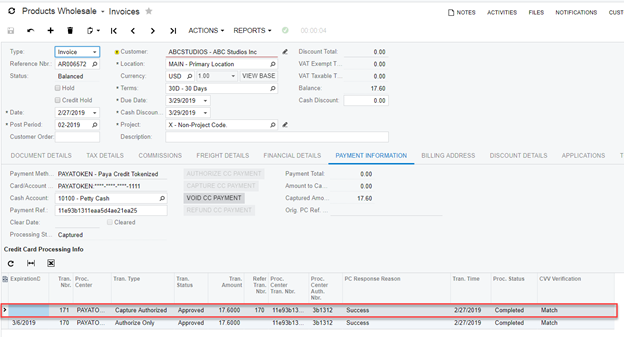 These are the instructions on how to process credit card payments against an invoice within Acumatica. These payments are processed through Accounts Receivable. Select Invoice from the Type dropdown, then select the customer. Select the Payment Information tab. Click Authorize CC Payment for the invoice. After successful authorization of payment, the Processing Center, Transaction number, and Paya Connect Response will be generated. Click on Capture CC Payment. The Reference Transactions Number and the Transaction Type are generated. Click Void CC Auth / Payment button. 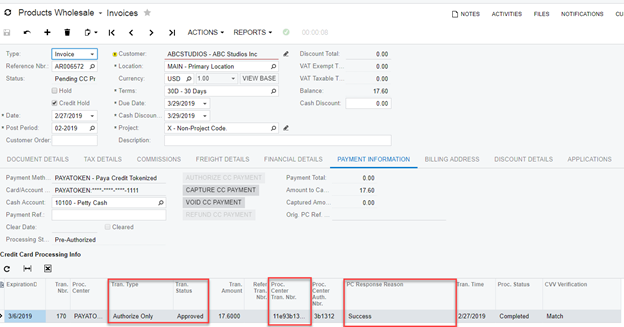 After successfully voiding the payment, the Processing Status is changed to Voided, and the Pre Auth number and the Capture Transaction Number are set to default.